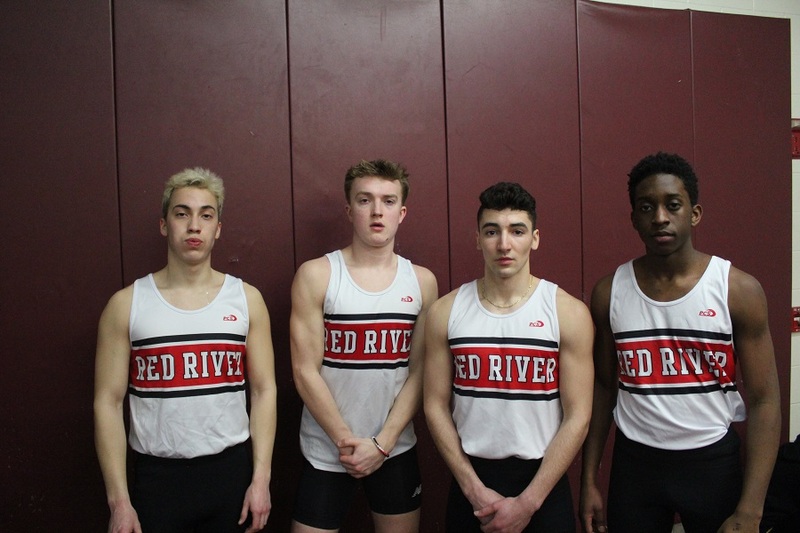 After suffering heavy graduation/transfer losses heading into the 2019 track and field season, many pegged this year to be a rebuilding one for the Red River Boys. 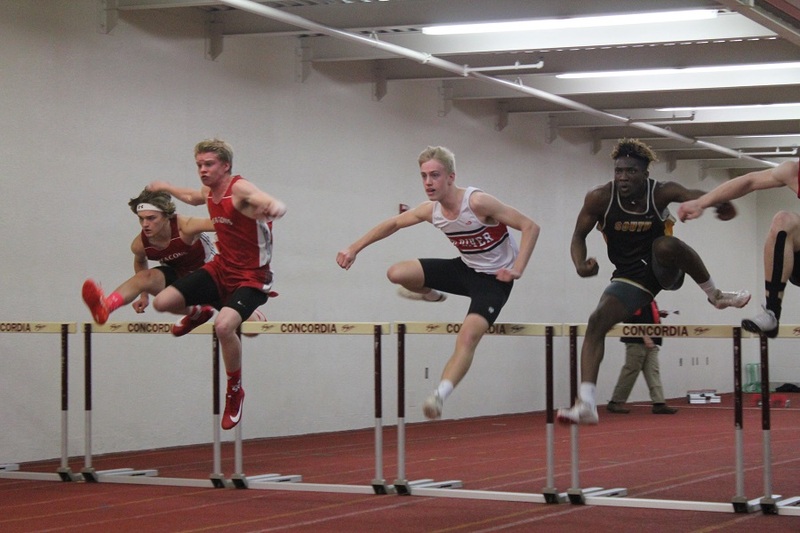 At the Cobber Indoor Saturday, the traditional season opener for the Roughriders, the team showed there may be more reload than rebuild for the 2019 squad. 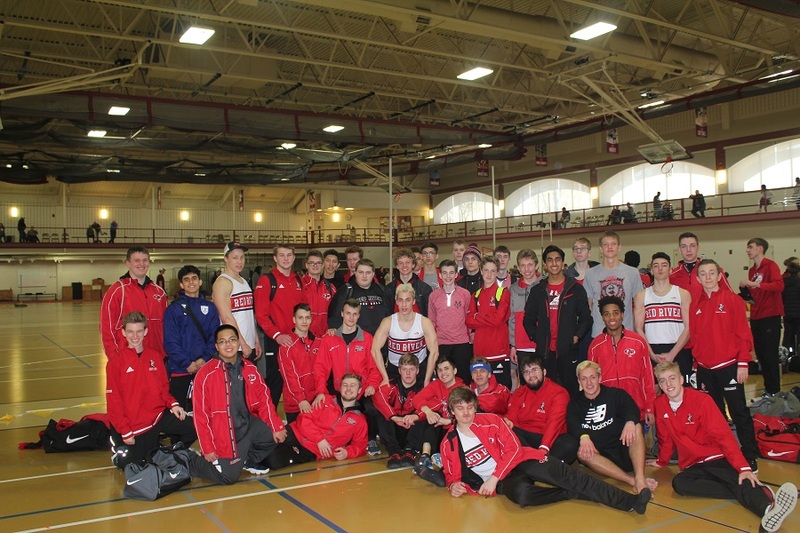 Behind four events wins and nine top-three finishes, the boys amassed a total of 144 points, 48 points in front of second place West Fargo. Junior Bryce Enerson (below), last year’s top point scorer, picked up where he left off with a big point haul. After another trip to the state basketball tournament limited his early season track practices, Enerson placed first in his signature event, the sprint hurdles (55mH-8.53). He also benefited from his renowned rebounding ability to clear 5’8 in the high jump and place 3rd. Overall, he finished with 16 points. Senior Stoker Short made a strong statement in his return to the oval. After spending most of his practice time in the newly formed Middle Distance group, led by Coach Dorsey, he unleashed the fastest 4×200 split of any RR athlete to come from behind and edge a WF Packer for 3rd place. Zack Topping, Austin Oehlke, and Ethan Brandvold rounded out the team (1:39.33). In the open 400m, he ran a smooth race to finish 4th in 55.49. After a seeding mishap put the A Squad 4×400 in the second heat, Stoker led off the relay and got out hard, placing significant distance between him and the rest of the field with a 55.9 split. Matching that split was Marcelles Sartwell, who ran his third great race of the day. First year athlete Keandre Anderson added to his strong debut with a 56.7 split, after placing 8th in the open 400. On the anchor leg, senior Alessandro Kroeger held ground, crossing the line for the heat win. Their time of 3:50.12 was good enough for second place overall, beating all teams but one from the first heat. 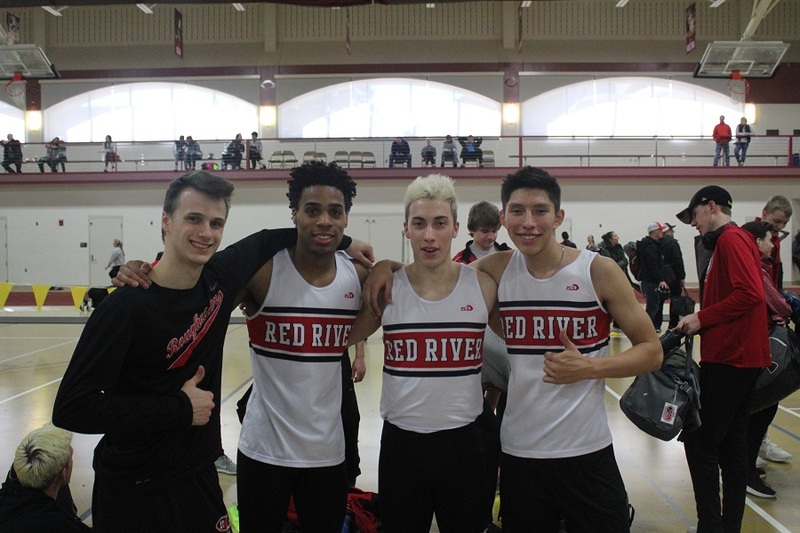 Mid-distance and distance runners had a great first outing at the Concordia indoor track meet on Saturday, March 16th, scoring 70 of Red River’s 144 points. 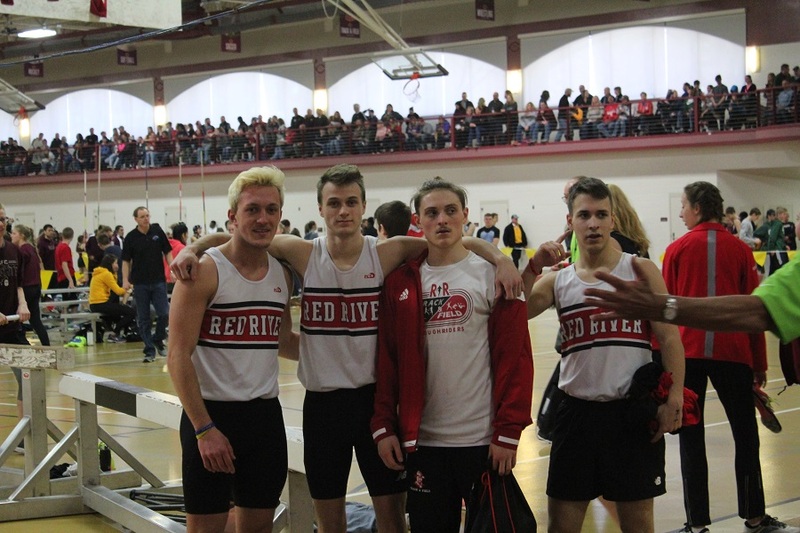 The meet started out strong with the 4x800m relay, in which the team of seniors Marcelles Sartwell (splitting 2:12.5), Zach Simon (2:12.4), Thomas Hugo (2:20.2), and freshman Hunter McHenry (2:17.0) finished first with a time of 9:02.12. 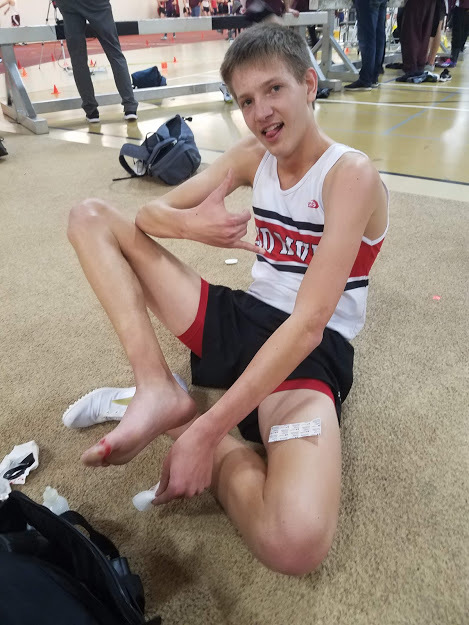 Three events later, senior Jake Arason won the mile in convincing fashion after negative-splitting the race, running his second half-mile four seconds faster than his first half-mile. His time of 4:50 is only three seconds behind his PR from last season. Also placing in the mile was junior Gavin Dorsey (5th- 5:04) and sophomores Ryan Prusak (6th- 5:05) and Broden Diederich (8th- 5:10). The 800m run came down to a thrilling finish between two Riders, with Sartwell (2:08.48) outkicking Arason (2:08.64) in the final stretch for 1st and 2nd place, respectively. 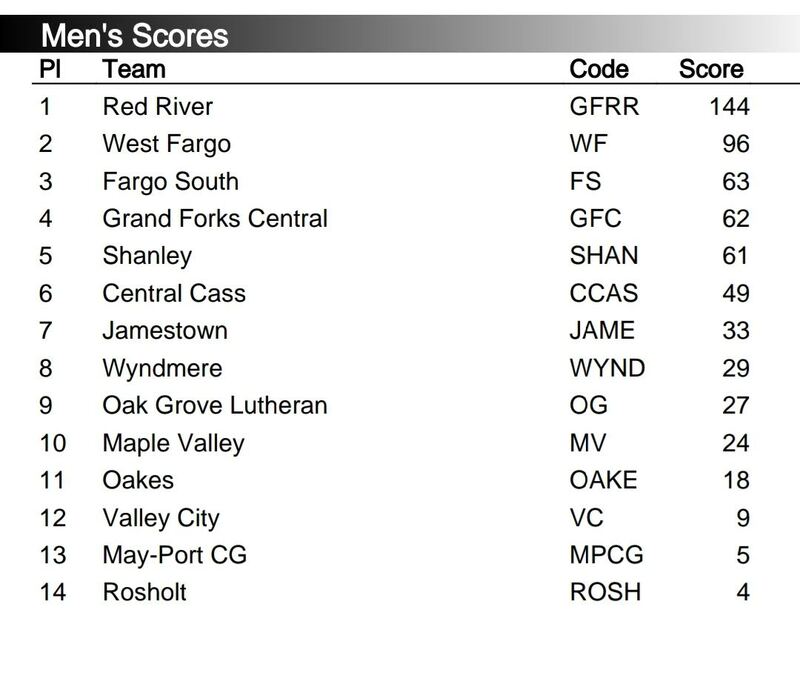 Arason (18 pts) and Sartwell (14.5 pts) finished the meet as two of the top three point scorers for Red River. 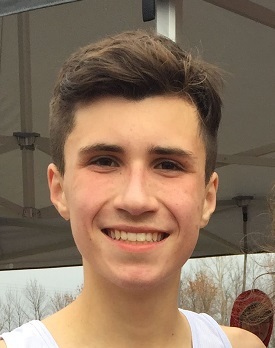 8th grader Grant Lelm (2:21.72) also performed well in the 800m, placing 8th. In the second to last event of the day, the Riders scored 23 points with a 2-3-4-5 finish in the 3200m. McHenry led the group with a time of 10:42, followed by Hugo (10:43), Simon (10:49), and Diederich (11:16). All four were key members of Red River’s EDC Champion cross country team in the fall. In the shot put ring, the big story was the show put on by senior Brett Klefstad. With the state basketball tournament and a mid-week blizzard/roof collapse fear eliminating quality throwing preparation, expectations were to get some quality reps and familiarity back with the event. Klefstad had other ideas. After nearly hitting a PR on his first throw and matching his PR on his second attempt, he uncorked a 49’2 toss on his third throw, a personal best by almost three feet. The mark exceeds the outdoor state qualifying standard of 48’6. Senior Cade Johnson (40’8) and sophomore Marhsal Buelow (34’2) also hit big PR’s. Junior Justin Erickson, new to the shot put event, turned some heads with a 37’7.5 toss. Junior Kaden Rohloff, a returning state qualifier in the pole vault, cleared 11’6 and placed second in the event. Sophomore Erik Walker (9’6) placed 4th, and freshman Mason Gillespie cleared 7’6 in his pole vault debut to place 8th. Most importantly, the meet served as an introduction to the sport for many newcomers and a baseline indicator for returners. 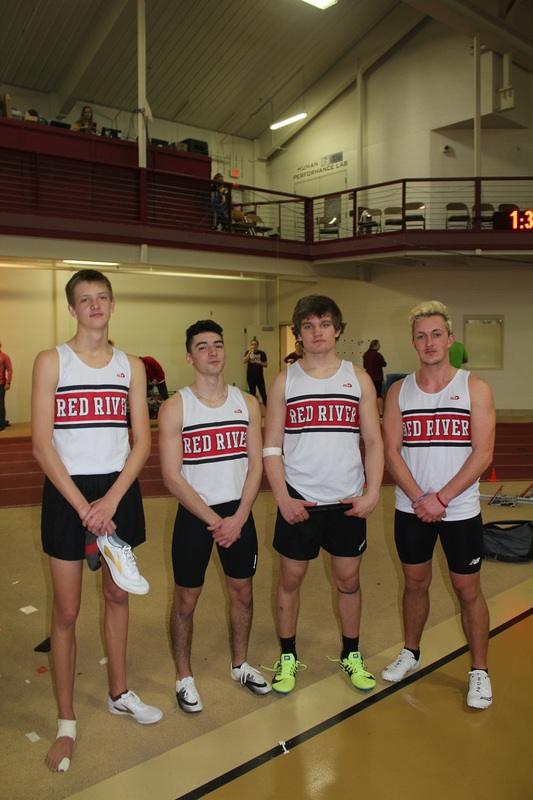 Next week, the Riders will head to NDSU to compete at the State Indoor on Friday. Those who don’t compete Friday will have the NDSU JV Indoor on Saturday morning. 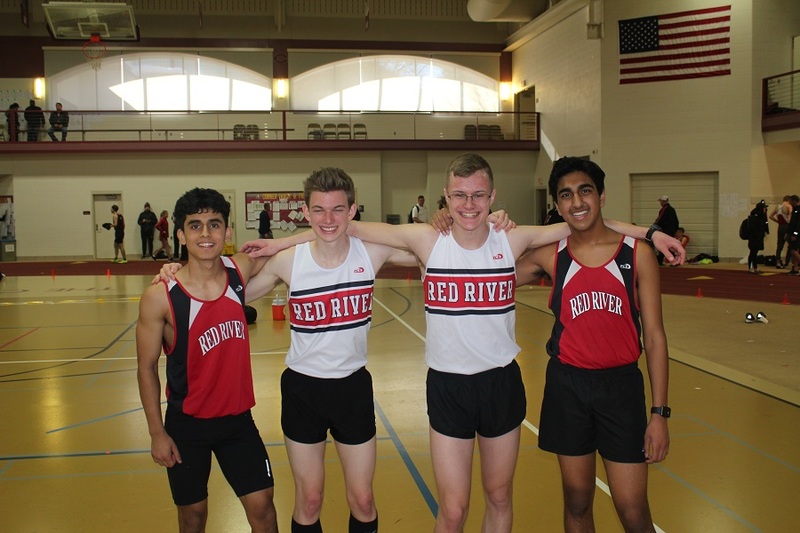 Freshman Hunter McHenry, immediately before his 3200m race: Coach, I’m going to look funny in this red jersey. Coach Dafoe: Gotta letter first, big guy. Freshman Hunter McHenry, after already running a leg on the winning 4×8 relay team and immediately after placing 2nd in the 3200 in his first high school track meet with hands on his hips and a smile on his face: Hey, coach, guess I got that letter.